UBC’s Conferences and Accommodation staff (from left) Suzanne Nazareno, Debbie Harding, and Maaike Ammerlaan are prepared for a busy tourist season this summer. At UBC, summer means the busy season gets underway in earnest – the campus turns into the biggest conference and accommodation centre in the Okanagan. With the academic year over, the hustle and bustle of student move-out from the residences only means there is a transition in the makeup of the guests staying on campus. And summer 2013 is shaping up to be a rather busy one, says UBC Conference Sales and Services Manager Debbie Harding. 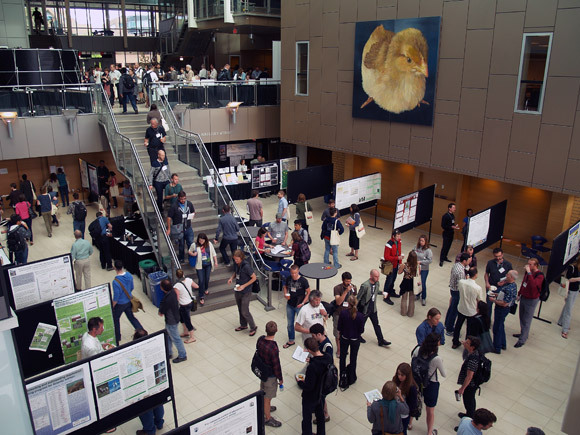 This season started with a bang as UBC’s Okanagan campus hosted the eighth-annual Canadian Society for Ecology and Evolution conference this week, alongside the 2013 A/BC Inorganic Discussion Weekend. More than 500 visitors were on campus for the two events – and Harding says the majority booked rooms in the Cascade, Monashee, and Purcell student residences. For those on retreats or with business plans, UBC’s Conferences and Accommodation staff can help with events of every size. There are more than 50 meeting rooms on campus, plus several large lecture halls with stadium seating and full teleconferencing capability. There are workshop spaces, exhibit and trade show areas, sports facilities, multi-media technology, and on-site catering. UBC has more than 650 rooms available with a variety of summer rental options. Choices include: single rooms, with access to a shared bathroom, kitchen, and common lounge; suites in the Monashee building, ranging from a studio option to a four-bedroom family suite, all with private bathrooms, queen beds, and fully-equipped kitchens; and the four-bedroom Cascade apartments, with private kitchen, living room, and two bathrooms. Harding says UBC’s location, just two kilometres from Kelowna’s airport, is a definite bonus, and it helps with the university’s appeal to groups that have plans before or after attending conferences – travellers, golfers, winery tours, athletes competing in summer events, and families looking at different options of stay. The rental units – with single rooms starting at $48 a night – include linens and housekeeping, high-speed Internet, air conditioning, and access to UBC’s fully-equipped gym, hiking trails, and the self-guided campus tour. Taylor Scanlon, co-chair for the recent Interdisciplinary Graduate Student Association graduate conference, says planning for the event was made easier by UBC staff. UBC’s three, two-bedroom townhomes are open for visitors year round. The two-storey rentals book up quickly, says Harding, as they’re popular for fall winery tours and ski groups in the winter. 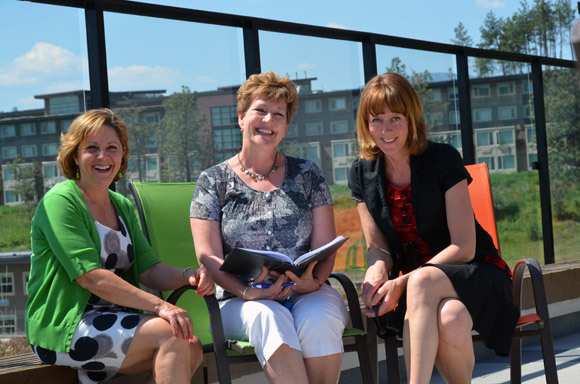 UBC’s Okanagan campus has amenities for staging conferences of any size.